We are happy to announce the results of our inaugural British Bank Awards, which harnessed the opinions of over 500 Smart Money People reviewers! Scooping the accolades ‘Best British Bank’, ‘Most Recommended Bank’, ‘Best Customer Service’, ‘Best Value for Money’ and ‘Best Current Account’ with its 1st Account, the internet and telephone-only bank proved customers don’t need to step into a branch to receive exceptional service. HSBC bombed in the Awards, taking bottom place in the overall league scoring just 3.2 out of 5. In fact, HSBC placed bottom in almost all categories, with one notable exception being ‘Best Business Banking Provider’ where HSBC was a runner-up to Barclays. Customers still value packaged accounts… for now! Despite negativity in the financial services industry following a recent Which? report which highlights packaged accounts as ‘failing to deliver’, Smart Money People reviewers were 20% more satisfied with packaged accounts than basic current accounts. Current account switchers are really, really happy! There is a very definite theme among current accounts switchers. The overall rating given by current account switchers shows an exceptional satisfaction score of 97% which is a fantastic and demonstrates that switching banks can work, with one customer calling switching banks “the best financial decision I have ever made.” In comparison, non-switchers had a 70% satisfaction rating. It’s really interesting to note that Business bank accounts are the worst rated product on Smart Money People (with 23% rating them as 1 or 2 stars). In this market, the “big four” banks (HSBC, Barclays, RBS and Lloyds Banking Group) hold an 85% market share, and a Competition and Markets Authority (CMA) inquiry is currently underway into the competitiveness in the Business Bank Account market. 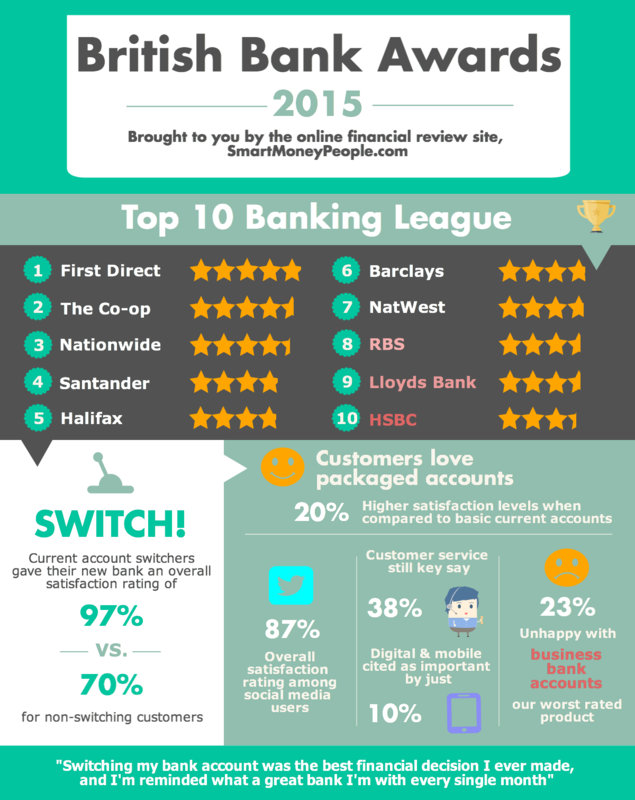 All banks featured in our league table have harnessed social media to better engage and respond to customer queries. Many customers like the use of Twitter to resolve queries quickly and appreciate banks adopting communication channels that they want to use. In fact the overall rating given by those customers mentioning social media in their review was 87% marking this set of customers as among the happiest. 47% of all reviews also discussed the multichannel banking experience, showing that customers value the ability to switch seamlessly between digital, branch and social media when communicating and transacting with their bank. One lucky reviewer, Sarah Hendriks won the British Bank Awards’ prize for best review, receiving a £200 for sharing her customer experience on First Direct. Sarah switched originally to take advantage of a £125 incentive. She posted: “Although they don’t have the face-to-face availability of some banks, their phone service is superb, not to mention their products.